An Ivy League professor has shared her opinion on the Covington Catholic school students in the wake of the controversy surrounding a clip of a video that went viral on Social Media(D). ClashDaily has thoroughly covered the controversy surrounding MAGA hat wearing Catholic students in Washington attending the March For Life, a Native American veteran in Washington for the Indigenous Peoples Rally, and a small group of Black Hebrews hurling racist and homophobic insults at the teens. Dear ‘Media’: Why No Interest In The VILE Black Hebrews And Their Racism & Homophobia? This incident has been revealing. The Media(D) jumped at the chance to denounce a group of (mostly) white, Catholic boys wearing MAGA hats, and gave the other two groups a free pass from any public scrutiny. Hollywood elites and D-listers alike came out and called for violence against them, with no repercussions from Social Media(D). But when it became clear that there was much more to the story, some have backed down. Despite that, Covington High School in Kentucky has been closed due to safety concerns as the boys and their families have received threats of violence and even death threats. 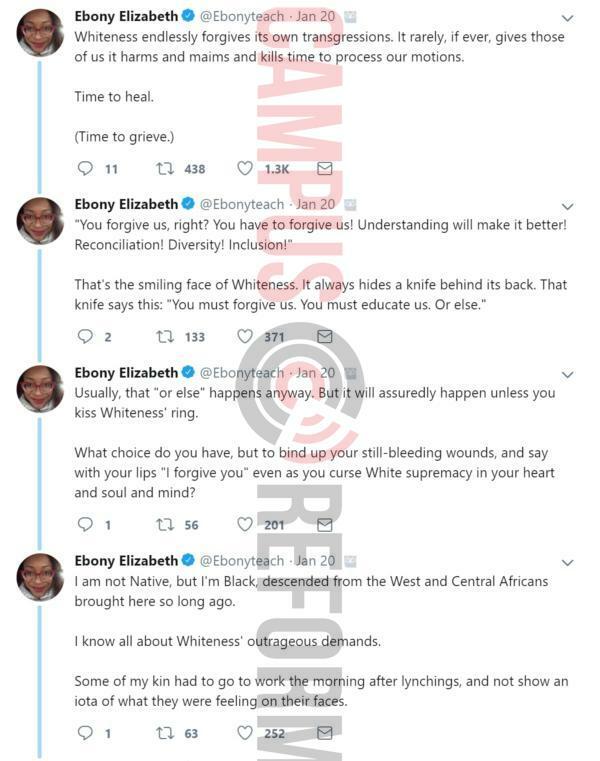 An Ivy League professor, Dr. Ebony Elizabeth Thomas of the University of Pennsylvania’s Graduate School of Education also put her thoughts out on Twitter…briefly. After garnering some attention, (which was presumably the point of tweeting her musings,) she made her account private. Now imagine if Dr. Thomas was a white professor saying this about a black high school student. 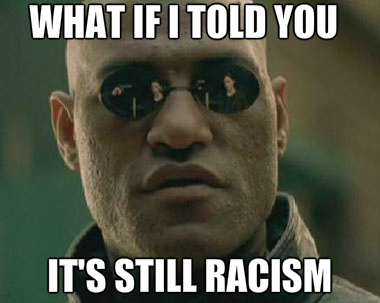 That would be racism, right? But that’s not all Dr. Thomas wrote on Sunday evening. In a series of now hidden tweets, she lambasted the teen and white people in general. This chick is something else. 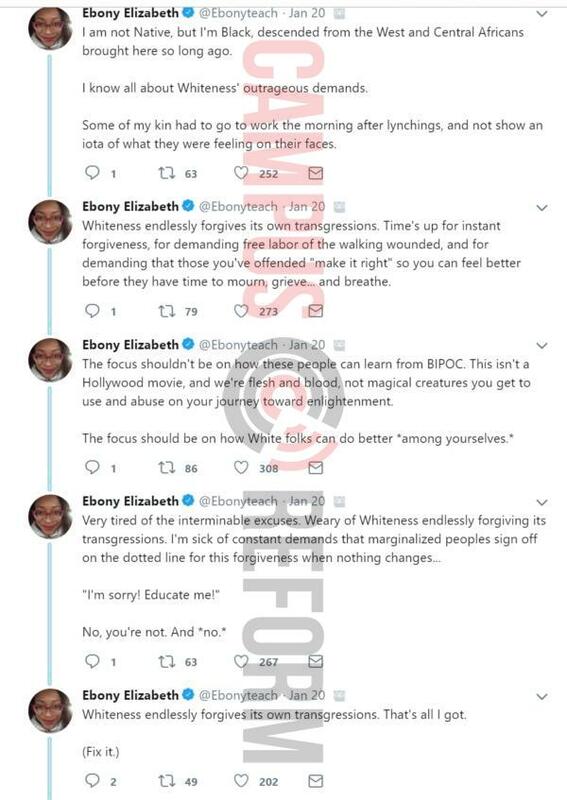 Now that the nearly two hours of video has been posted online, and it’s obvious that the Black Hebrews were harassing both the Indigenous people and the MAGA-hat Catholic teens, will Dr. Thomas walk back any of her statements? Unlikely. 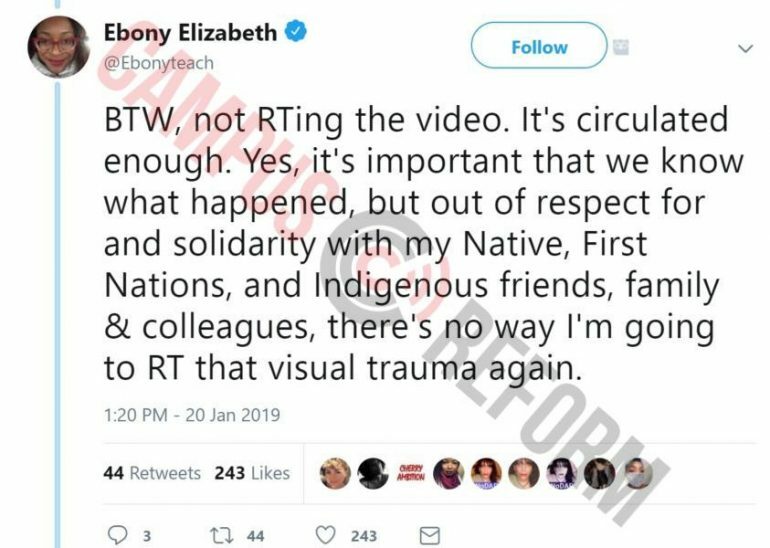 She also said that she is not retweeting the video because it’s ‘visual trauma’. This woman has a doctorate degree. 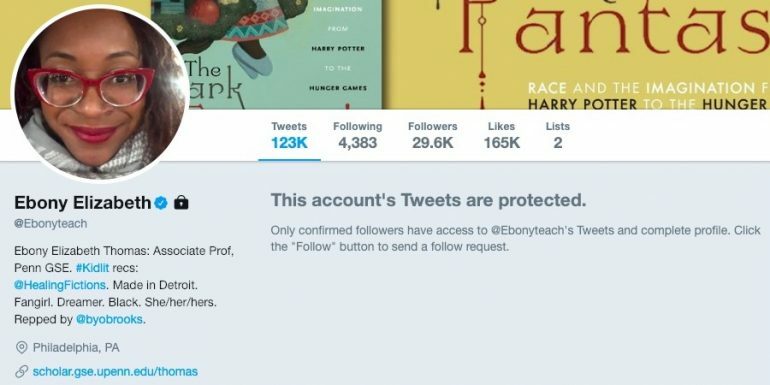 Dr. Thomas is an English professor who says that literature must be reconsidered in our current age of ‘societal redefinition’ — her theories are based on critical race theory which is blatantly Marxist in origin. These are the pseudo-science disciplines that Dr. Jordan B. Peterson rails against. I don’t have time to go into it now, but here’s a great article on critical theory in academia and the backlash against it signaled by the rise in prominence of Dr. Jordan Peterson. From her experiences in the classroom, teacher research, and dissertation study, Dr. Thomas came to believe that the language students and teachers use, the literacies that they engage in both inside and outside of school settings, and the literature and other texts they read and interact with must be reconsidered during this early 21st century era of social change and societal redefinition. In her work, Dr. Thomas synthesizes postcolonial, critical, and critical race theory with data from her empirical research in classrooms to examine the ways that literature is positioned in schooling and society today. As children’s and young adult literary empires continue to dominate publishing and Hollywood, she strongly believes that the field has the potential to become one of the most effective postcolonial, critical, and activist projects of all. Always remember, Marxism, even Cultural Marxism, leads to destruction. We need to fight this ideology. Here’s one fantastic guide on how to fight back.